2 February 28 - March 13, 2018 Chicago Street Journal What do actress Danai Gurira and film producer Sidra Smith have in common? Besides the fact that they're both beautiful Black women, these trailblazers also traded in long locks for a bald head. Gurira's big chop was for the upcoming Black Panther movie while Sidra's signature look happened after a years-long obsession with hair extensions. So are Beauty Salons about to have Bald Head blues? Chicago Police Superintendent Eddie Johnson testified in Springfield in favor of new gun legislation, part of which is written and named in honor of slain 18th District Commander Paul Bauer. Many expressed who Chicagoans are heavy in mourn with the loss Commander Paul Bauer. Commander Bauer stood for the highest ideals of the police department and the city. Mayor Rham Emmanuel said his death is a tragic reminder of the dangerous duty the men and women of our police department accept to ensure the safety of us all. I ask every Chicagoan to keep Commander Bauer, his family, his friends and the entire Chicago Police Department in their thoughts and prayers during this difficult time”. Rep. Ford Urging Governor to Reopen Vehicle Emission Sites Illinois State Representative La Shawn K. Ford is questioning if the Illinois emission program is still useful. On November 1, 2016, several vehicle emissions facilities closed in Chicago to reduce costs and streamline operations. Currently, this leaves Chicago residents driving to suburban cities defeating the purpose of cutting emissions. “This is absolutely a step backward in reducing the city's air pollution problem,” said Ford. “Many concerned citizens, including myself, wonder if the goal to reduce costs turned into a costlier toll on our environment. Emission testing is designed to protect the environment and not contribute to the problem.” The Federal Clean Air Act Amendments of 1990 requires emissions testing programs in large, metropolitan areas which do not meet specific federal air quality standards. In Illinois significant progress has been made, levels of air pollution in Chicago and Metro- East St. Louis areas still exceed these standards. “The closures of all sites in Chicago defeats the purpose of reducing emission, “said Ford. “Illinois' emission program seems to contribute to the carbon emissions that we are trying to prevent by having Chicago residents drive farther to get tests done.” According to the Vehicle Emissions Inspection Law of 1995, The agency shall establish a program to begin February 1, 2007, to reduce the emission of pollutants by motor vehicles. The Illinois EPA’s study concluded that for residents of Chicago, many would drive on average an additional four miles. This is a significant change that will add to vehicle emissions, in direct contrast to the purpose of the Agency’s directive. Ald. Sophia King hosted a town hall to discuss the Michael Reese Development of Amazon Corporation. The town hall will featured a presentation with the latest updates on the development. The Alderman’s Advisory Council and presented what they have to say about the project moving forward and Community input. The benefit is the 50,000 jobs that Amazon has said it will bring to any city and employment and contracting opportunities directly with Amazon, and its the ripple effect to the Bronzeville community. Now accepting applications The Facebook Community Leadership Program: Applications are now open for our residency and fellowship. Facebook is looking for community leaders across the Facebook family of apps and services with a proven track record of leading communities that have positive impact, build common ground and foster in-person connections. The Facebook Community Leadership Program exists to empower and support leaders from around the world who have built meaningful communities through the Facebook family of apps and services. Both the residency and the fellowship come with training, support and funding. Up to five community leaders with the boldest, highest impact ideas will be selected from around the world as community leaders in residence with a grant of up to $1,000,000 USD each to fund their proposal. Up to 100 people will be selected as community leadership fellows and will receive a grant of up to $50,000 USD each to be used for a specific community initiative. Drug testing or screening for public assistance applicants At least 15 states have passed legislation regarding drug testing or screening for public assistance applicants or recipients (Alabama, Arkansas, Arizona, Florida, Georgia, Kansas, Michigan, Mississippi, Missouri, North Carolina, Oklahoma, Tennessee, Utah, West Virginia and Wisconsin.) at least 20 states have proposed legislation. Some apply to all applicants; others include specific language that there is a reason to believe the (Continued on page 10) Continuing on hair: Jesse Jackson Jr. congratulations to Oprah Winfrey on her accomplishments and receiving the Cecile B DeMille award at the Golden Globes. Winfrey Midas touch, she want to keep. And not Gray touch up being President after four years. Could be the reason why she will not run. A journalist who theorized that many people in the United States are now in a state of "outrage fatigue." The scandalous behavior of the White House, the destructive policies and the torrent of tweets by Donald Trump are numbing many people. After all, the deluge of dishonor, hypocrisy and pernicious public policies can feel overwhelming. Emil Jones Jr. sadi J.B. Pritzker has shown “what he really thinks about black folks” Saying “He called me "crass," and referred to Secretary of State Jesse White as the "least offensive" candidate to replace Barack Obama. You see, he still thinks that Jesse White is offensive, but if he is forced to choose an African-American, Jesse White is least offensive to him. JB showed his true colors again four years later, when he called President Obama “mediocre”. Voters want an alternative to candidates who talk about African-American leaders as if we were pawns in their political insider enterprise. The P&E of CSJ is an artist, his work can be seen at the BOP Business Center on 79th Street. and the Center of 69tha and Emerald Real Deep, Hood Hip or Brother Hood was hooping around the business of Willie Wilson, that he is doing the right in the community and/or is he getting ready to run for Mayor of Chicago again. However, the is talk to drive a Westside 2019 Ford drive east on Madison Street to LaSalle Street. Syron Smith of the non-profit University Block Club organizations in in Atlanta, looks like they are in the money now-a– days. However, word is their block members from around the county has been giving $1 a month for its operations. In that last year they gave a young man of New Orleans a major Christmas donation. Vincent Gilbert Regional vice president of the Illinois Black Chamber of Commerce has started communications with Black Wall Street Chicago in some operations for Black businesses. has been It is really true CSJ publisher and editor is really an artist as well. Oh was. Publisher and Editor: Ron Carter Associate Publisher Digital Sonja Cassandra Perdue General Manger John Alexander, Writers: Donnell Robinson, Frank Ottman, Sonja Cassandra Perdue Circulation: Clifton Edgeson, and Roosevelt Martin Photographers: Parthenia Luke, John Alexander Chicago Street Journal 815 West 63rd Street Chicago, IL 60637. E-mail: ChicagoStJournal@aol.com 773.595.5229 http://www.ChicagoStreetJournal.org Follow us on Facebook and Twitter at ChicagoStreetJournal Columbia University South Street Journal archive: http://southside.ccnmtl.columbia.edu/ Archived by Columbia University’s Urban Research Workshop (URW) , back issues from 1993 to 2006 of Chicago Street Journal’s predecessor, the South Street Journal, were donated to provide material for URW students to collaboratively research themes such as gentrification, racism, political affairs, and youth development. 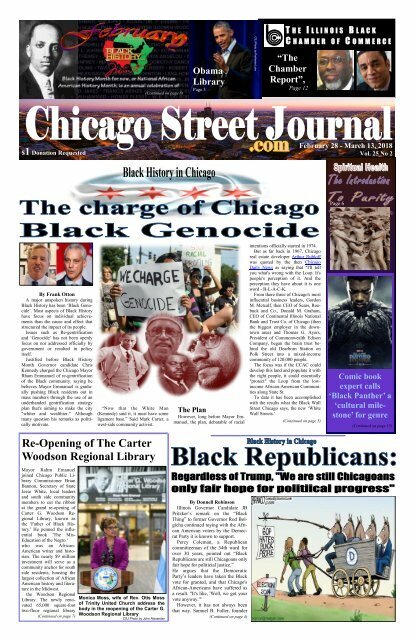 Magazine: Black Genocide in Chicago - February 28, 2018 Edition of Chicago Street Journal.